Archaeologists from CSIC discovered an intact sarcophagus of a child in Luxor, which would let us learn more about ancient Egypt, of which very little is known. A group of archaeologists from the National Research Council (CSIC) discovered in Luxor, Egypt, the intact sarcophagus of a child who lived during the seventeenth dynasty, about 1550 years before Christ, as part of XII Djehuty Project campaign. The coffin, containing a child that could have died at age 5 based on the radiographs, is made of wood, measures 90 inches and no written or painted decoration. Around him were several wooden figures, all located in an excavation in the necropolis of Dra Abu el-Naga, in ancient Thebes. 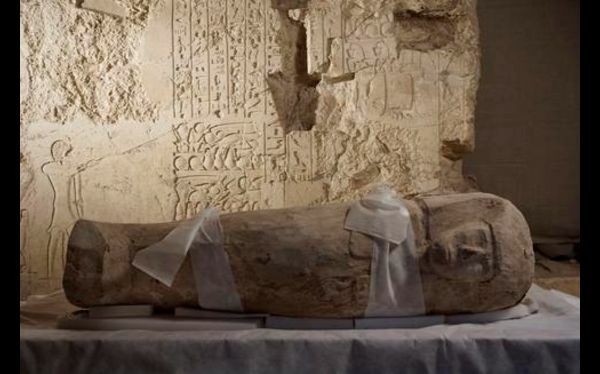 “This discovery is particularly important because it is intact coffin, and along with the accompanying objects that can provide a wealth of information about a period of history of ancient Egypt about which little is known,” said José Manuel Galán, CSIC researcher. The figures are the name of Ahmose and Ahmose-sa-pa-go, a crown prince who lived in transition from XVII to the XVIII dynasty and who died as a child. Still we do not know why, but was revered as a king and was worshiped for 500 years. “Making a connection regarding the objects that we found, we think that this burial site could be reserved for royals, but still do not know the identity of the mummy we found, as the sarcophagus contains no registration,” he said. This finding would explain the enormous reservoir that had more than two thousand pottery vessels in the chapels made of adobe, and the reason for the location of the funeral monument of Djehuty at this end of the necropolis.